The human body has some amazing natural attributes and these attributes are all related to how Ki flows. I am only going to go through some that are highly relevant to Aiki-jutsu-do. These attributes are so important that without them you will never be a complete martial artist. Stretch out your arm in a natural way without locking the elbow and relaxing the muscles. Project Ki from your Center to the palm of your hand and beyond. The beyond is important. Due to the relaxed state of the muscles they are only tensed by Ki when needed. This prevents getting tired quickly. The unbendable arm is used plentiful. When rolling, falling, blocking, pushing, deflecting and inside techniques. When used in a roll or a block, the hand is turned so that the side of the hand is inline with the outer circle of the arm. Relax your hand and shake it loose then make a ring with your thumb and another finger. Project your Ki in a circle by visualizing a solid circle. Let someone try to separate them. Just relax and keep projecting. 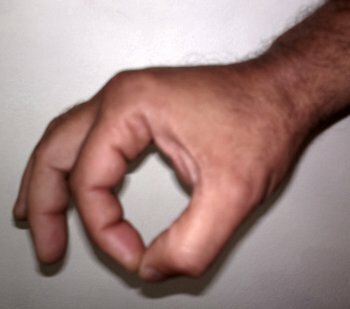 You will find that it's impossible for anyone to pull your two circled fingers apart. You can use this technique in many things in your daily life. To stand like a mountain does not mean to resist, but to accept and absorb applied incoming force. Project Ki downward from the Center to the bottom of your feet. Do not lean forward or backwards. Use abdomen breathing. Being fluid means that your muscles are relaxed and movements are controlled from the nearest joint. Usually movement is combined with movement of the Center i.e. forward, backward, sideways or other. By moving the Center up and down while moving causes a wave movement. In essence, every Aiki technique is done in a wave movement. When your legs come together you go up, and when they spread you go down. Always remain erect in the Center. Arms move in tandem with the Center and not the other way around. The Center controls everything. Up, down and up. Down, up and down. By projecting Ki through your arm downward, it becomes heavy and uke will not be able to move your arm in any direction. By projecting Ki through your feet downward, you can become unliftable ot at least heavy to lift. Visualize that you have roots and see the roots growing. It can come in handy when a large and strong uke intends to pick you up. When facing an uke that stands like a mountain, there is something you can do. Make a cutting circle with both arms in front of his Center and then try a wave push. It will work!